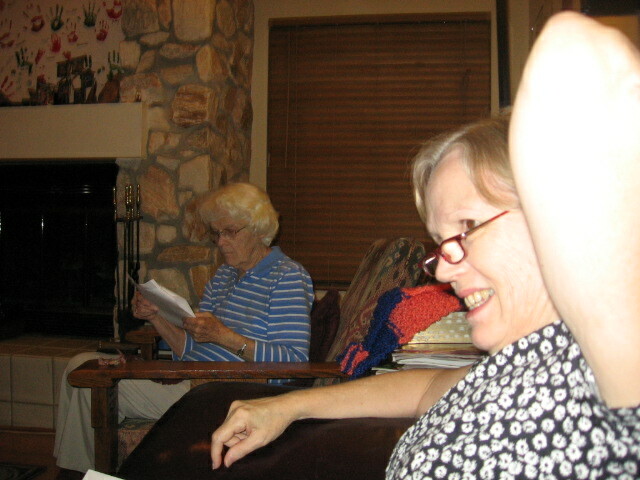 We departed briefly from our normal knitting activities at Wednesday Night Knitting and watched a DVD about Carding Wool. I love that someone at Interweave put the techniques of 4 different “stars” of the spinning world together in one production. I like to see what these folks who’ve just followed their interests in fiber (or, in Norman Kennedy’s case, his livelihood since childhood) have to say. 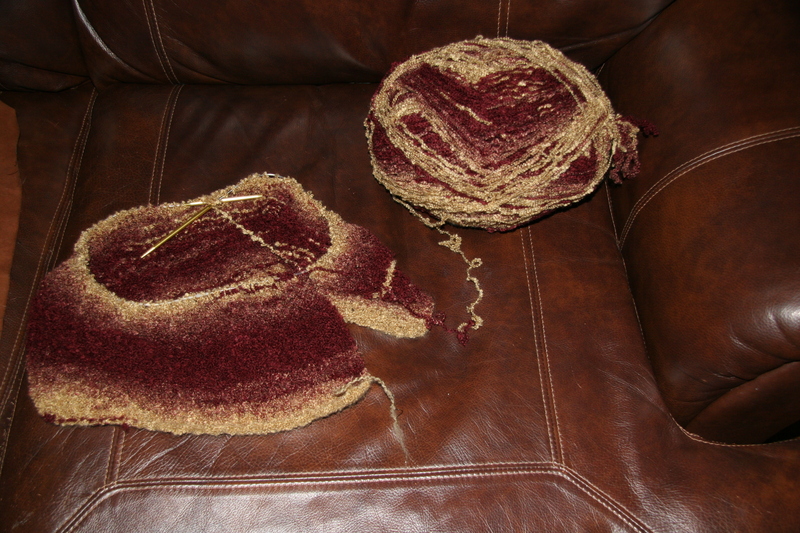 I am amazed at how much influence preparation of the fiber has to the final product, the handspun yarn. And because I feel that I am a grouper rather than a stringer, as far as learning styles go, I’ve enjoyed watching videos and reading texts about spinning and its myriad little components. 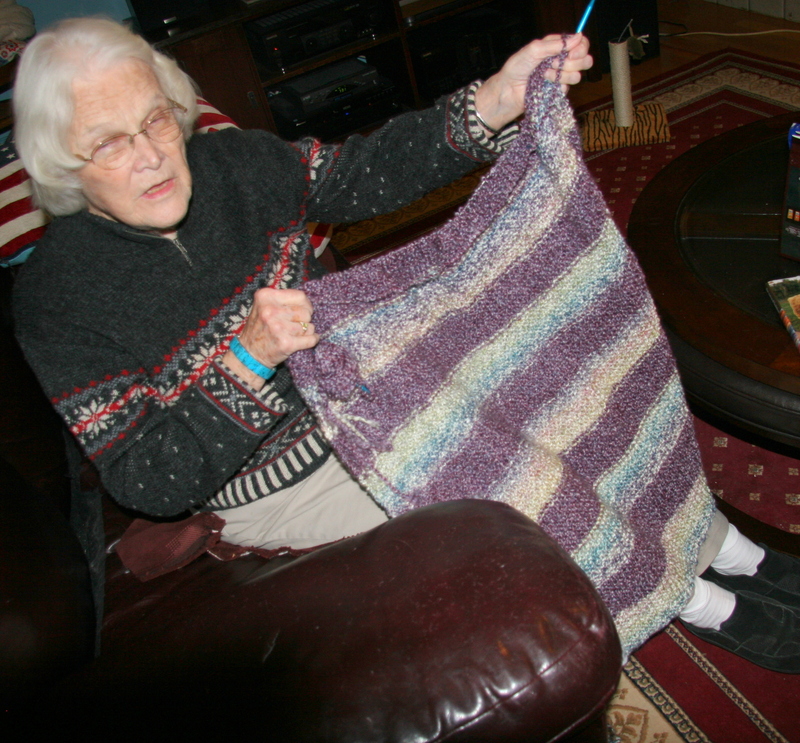 Lois worked on her lovely soft afghan, in the fluffy gray and blue and purple variegated acrylic yarn. Someone is going to feel very loved when wrapped up in that plushy blanket! I made progress on mine, which is supposed to be a “wrap” but it’s really an afghan that will have a wide ruffle around it. 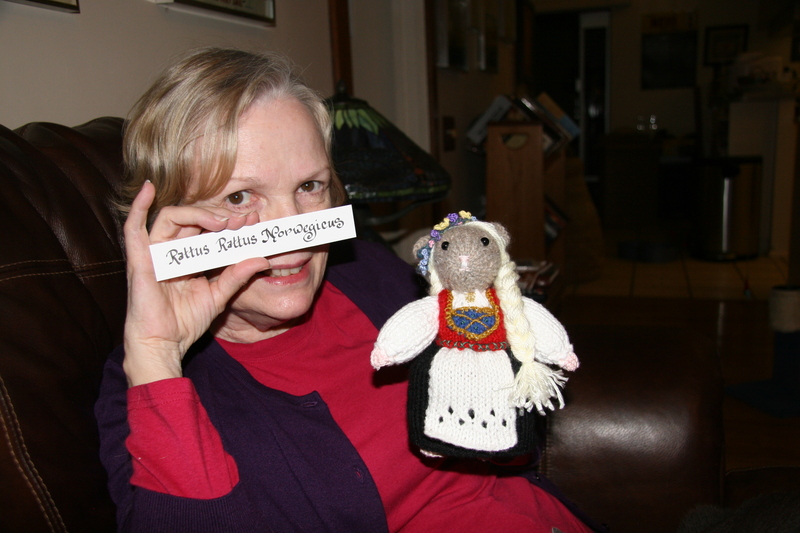 Ethel brought Rattie to show us her Norwegian costume. 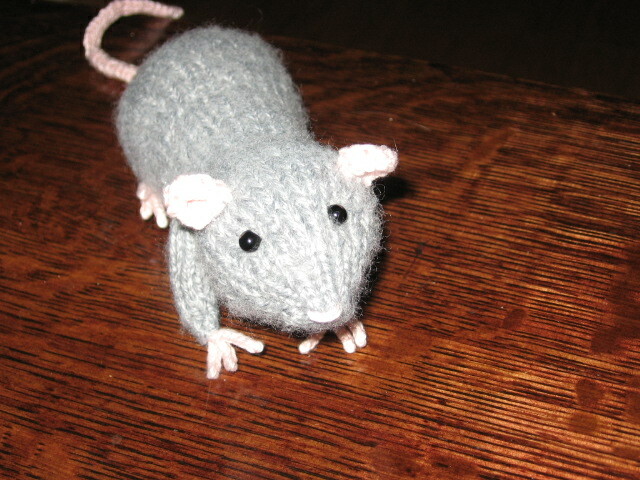 Since Rattie is of the hooded rat species, Ethel wants to make her a hood also. Her little vest is edged with gold and green cross-stitching, she has a golden needleworked necklace, and she is wearing a crocheted flower coronet. 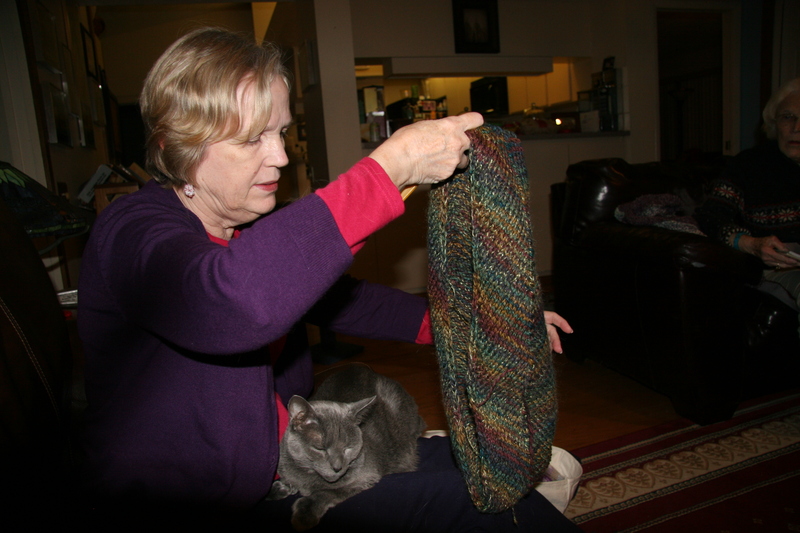 Ethel put the final touches on her knitted cowl by joining the ends with Kitchener Stitch and a Russian bind-off. 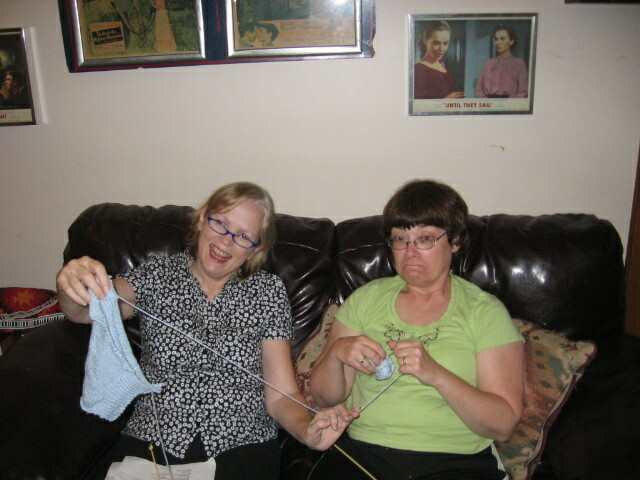 We were enthusiastic about all the cast-ons and bind-offs in her new book 211 Ways to Begin and End Your Knitting. That’s a lot of ways, isn’t it? 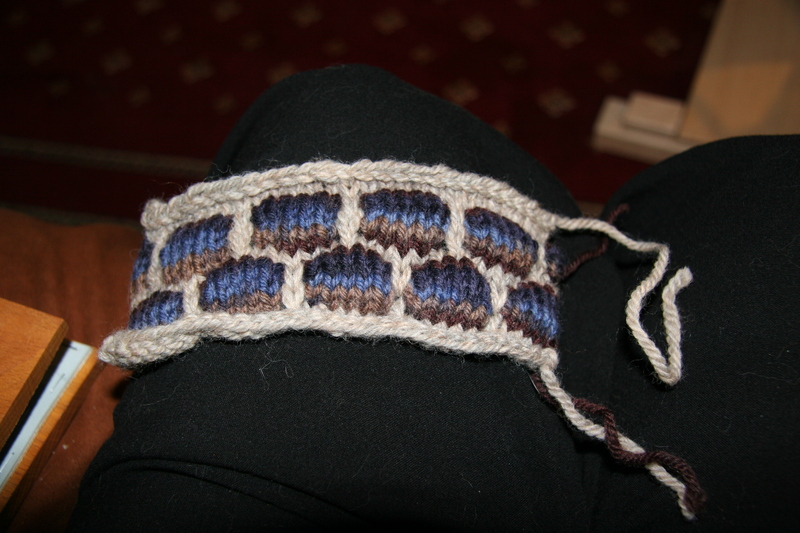 Here’s another recent work by Ethel, the cobble stitch. We discussed possibilities for the new ebay wheel, which appears to not be an antique as misrepresented in the online auction. 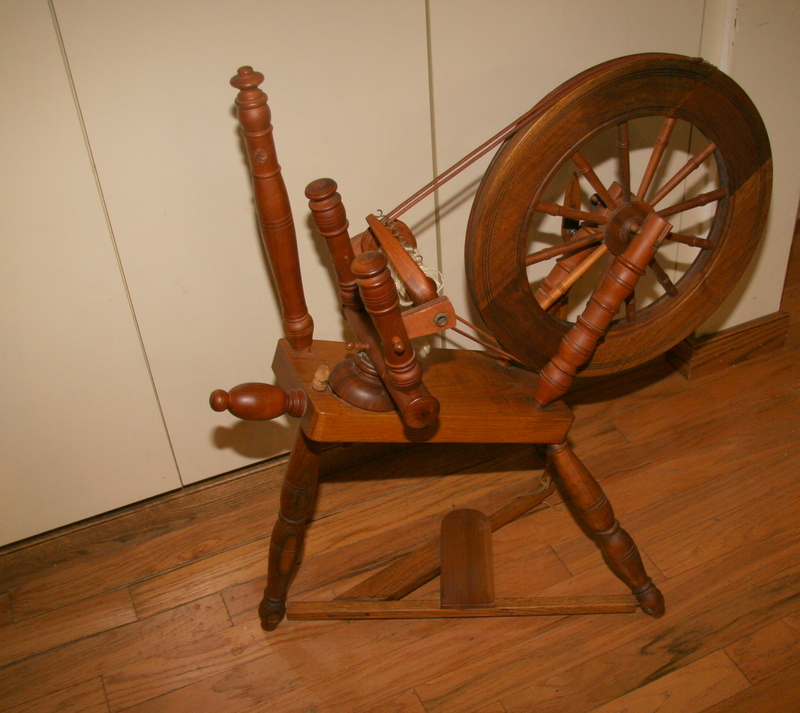 However, we may get her to spin and see what her cute little self can craft with us. 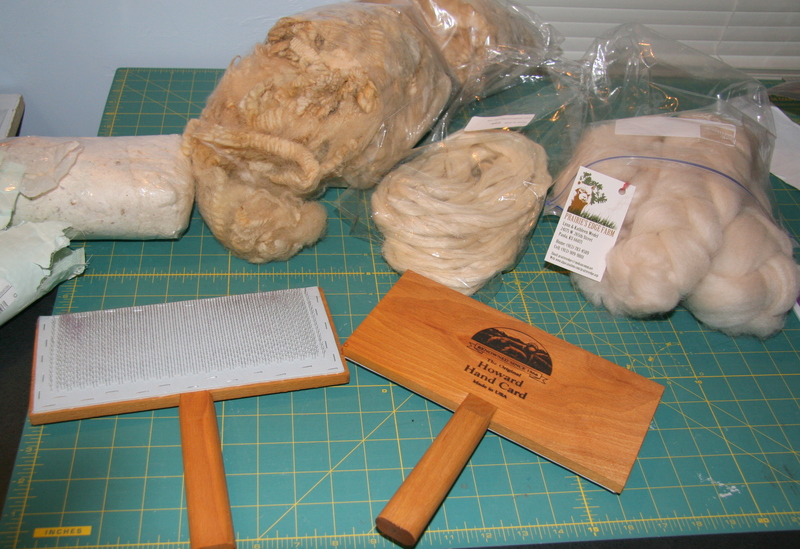 Next Wednesday will be the February meeting of the Gainesville Handweavers Guild; subject Navajo Weaving. It’s the last meeting before their parent organization’s (Florida Tropical Weaver’s Guild) annual conference. I’ve heard that some of the conference workshops are filled up but you may want to check out the small classes and the vendors from all over. 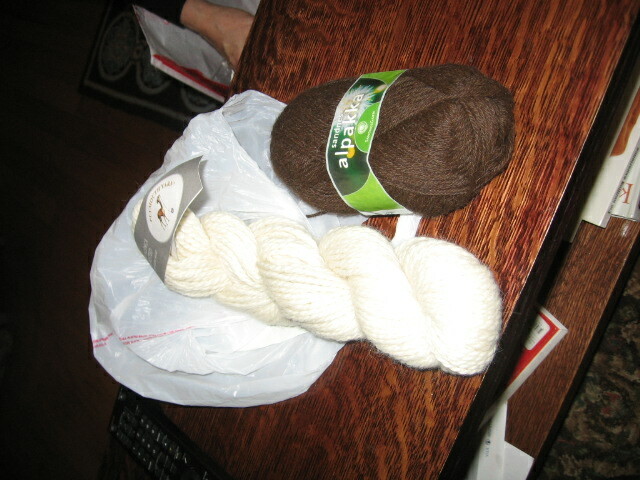 We knitted at my house again after a long (for me) hiatus! Thank goodness Ethel straightened me out with Maelo’s cashmere sweater, or it might have been Baby Bigfoot’s sweater, with foot-long arms! She quickly took out the extraneous 30-odd rows and got me back on the right track. 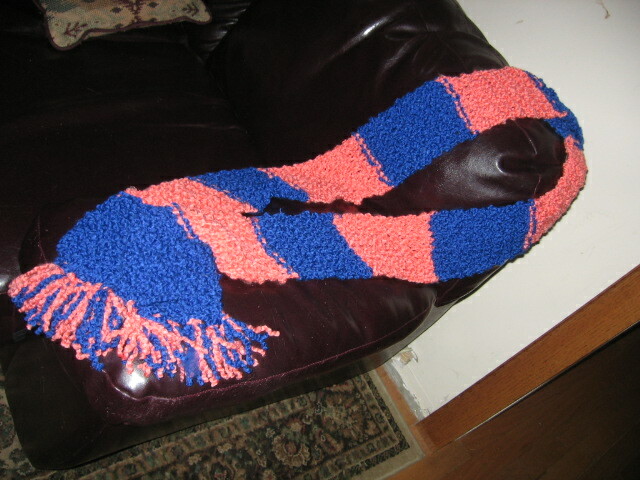 I finished the gator scarf (now that it’s almost summer) –but it’s been a little chilly at night so I may have a reason to wear it before football season…nah. Husband likes it, though :). do you see a potential rat in this? 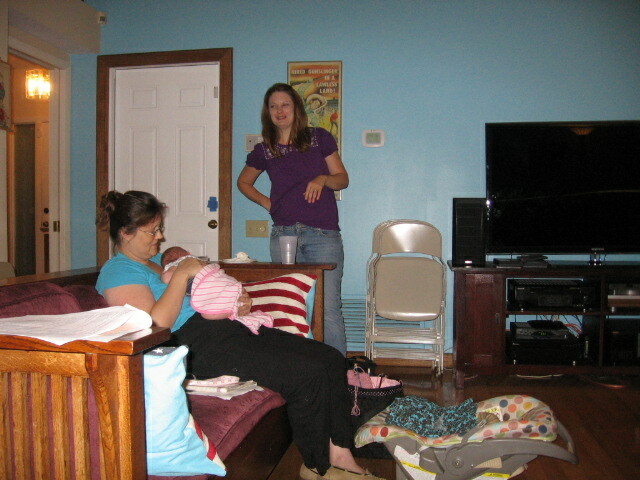 Beth came by for a minute and gave a verbal progress report on her dishcloth. Lisa continued to work on a hat in the round. Lois also worked on a hat in the round. We decided we like Ethel’s hat from the Louisa Harding book for an upcoming project for all of us. Lisa brought a chocolate pound cake made lighter with yogurt (mmmm!) 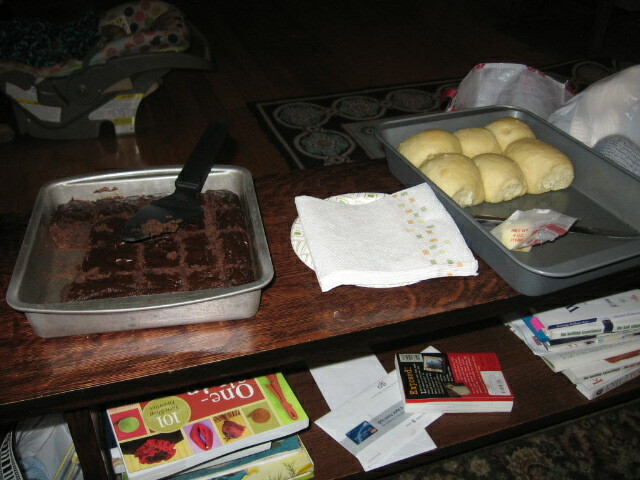 and I made some rolls from a Lion House mix I won in a contest on the Relief Society Sisters blog. I was so excited to get an email saying I was the winner of their awesome prize! 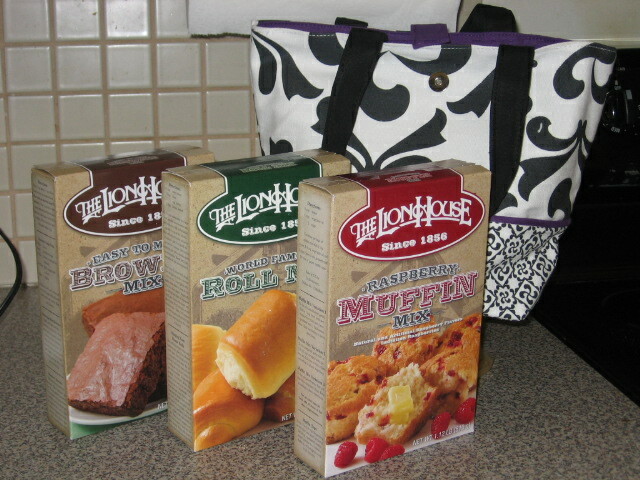 It’s a very cool tote bag from Deseret Books, with 3 Lion House mixes. Especially memorable since I visited Salt Lake City and saw the real Lion House over near Temple Square. Thank you so much for offering wonderful giveaways, it is fun to read about and belong to your website followers, RSSblog.com. 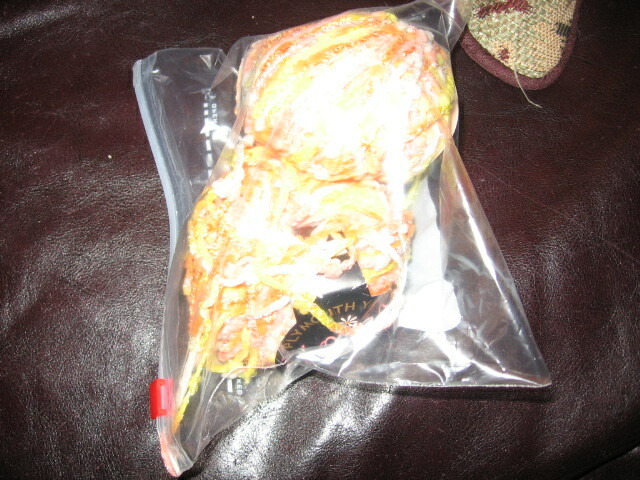 Ethel reported on her treasure from the Yarnworks yard sale in April, and she gifted me with 2 balls of this beautiful Plymouth Flower motif yarn; I can’t wait to find a suitable pattern to make something from it!